Discussion in 'General Advertisements' started by dvduval, May 16, 2008. It's easy to forget to backup your databases, or not do it because you don't want to bother with it today. The database backup tool makes it a lot easier to have peace of mind. You will be creating a backup on your local computer as well as uploading a backup to an FTP location, so you will have two backups. You can have an unlimited number of saved projects, so backing up all you databases is as easy as opening a project and making a couple of clicks. 1. Create a phpLD Account or login to your existing phpLD account. 2. Click on "Purchase Products" and select the Database Backup. 1. This Database Backup Tool is for use by one individual on one computer. 2. This application works with Windows XP and Vista, and may work with some older versions of Windows also. 3. The host of your database must allow remote connections. Please make sure this is possible before purchasing the software. 4. The tool connects to mySQL databases. 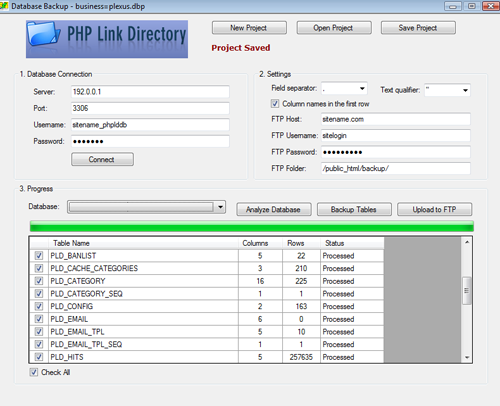 Below is a screenshot of the Database Backup Tool application. Section 2: Settings - this is where you can adjust the delimiters for fields for when they are saved to csv format. Also, this is where you set the FTP for where you will upload the zip backup. Section 3: Progress - shows processed tables and the status. 5. Input FTP settings. You can usually leave the fields at the top concerning the field separator and text delimiter the same, so no changes are needed in most cases. 6. Save the Project. Then you can open it in the future and run it again. RazorSQL includes a database backup tool that allows users to backup entire database schemas or databases. The backup tool generates data definition language (DDL) statements for database structures in the database or schema such as tables, views, indexes, procedures, triggers, functions, etc. The backup tool also generates SQL insert statements for data contained in the database tables. The database backup tool allows users to select the objects to backup, the character encoding of the backup file, the SQL statement separator to use when generating the backup file, and whether to fully qualify database object names in the generated SQL and DDL statements.